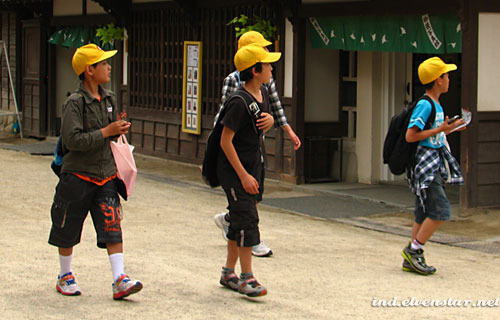 For day 3 in Kyoto, we went to the Toei Kyoto Studio Park (Kyoto Uzumasa Eigamura) and Kinkakuji, the Golden Pavilion. 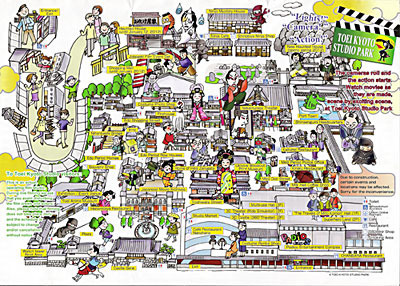 The English map for the studio park. The park is kind of like a miniature Universal Studios. 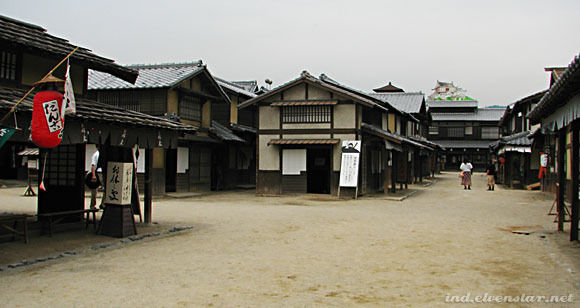 It consists of recreations of buildings from the Edo period and served as the backlot for various Japanese period dramas. (Apparently sometimes productions still shoot there now.) It isn’t an exciting place in that there are no exciting rides (though there’s a haunted house of some sort in there) and no parades or stuff you might expect in an amusement park. 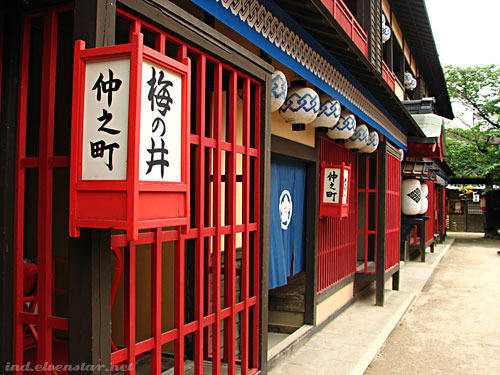 It’s just buildings – some merely facades, some have the interiors set up with props and stuff so you can wander in and out and take pictures. Reviews on TripAdvisor are generally poor, mostly complaining about lack of things to do and the lack of spoken English during performances and such. I went there with lowered expectations, but it turned out to be rather fun after all. 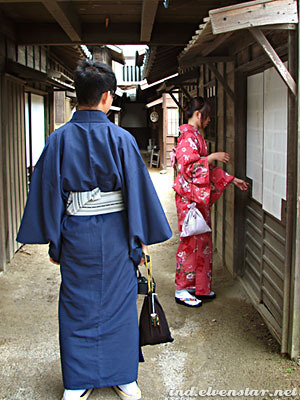 There are quite a number of kimono rental shops around Kyoto. The prices are roughly the same, as are the packages. 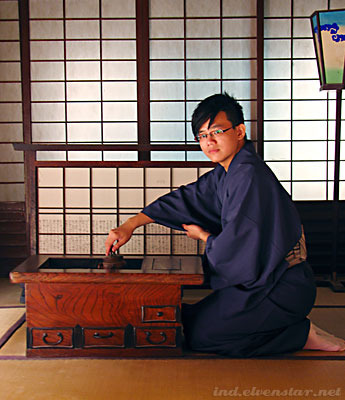 I initially wanted a different one, but Yang suggested this one instead, which had an overnight rental package and was cheaper so we didn’t have to rush back to the shop in the evening to return the outfits. I was only displeased with how plain the hairdo was. 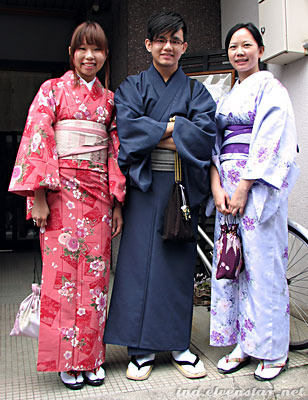 On previous days I saw other girls walking around in nice kimono with pretty hairstyles and ornaments and the memory of that compared with the normal bun styles they gave Yang and me was rather irritating. Oh well. 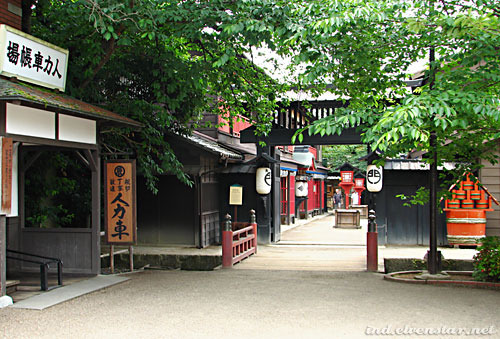 If you turn left at the start of Meiji Street, you see Yoshiwara Street. Danny having his turn at posing in another part. I think what increased the level of fun for us was that we were dressed “appropriately” for the place. 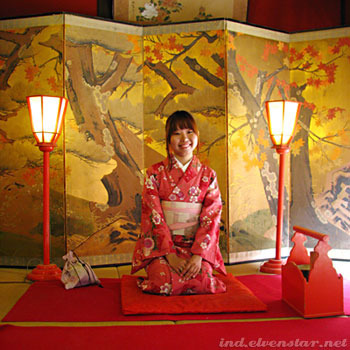 When you take photos there and you’re wearing a kimono, you look more like you belong there, rather than just being obviously a tourist. Random buckets. I’m guessing that ain olden days, huge barrels like that would have contained water and people used the buckets to scoop up the water? Japan being Japan, there must be a mascot somewhere. 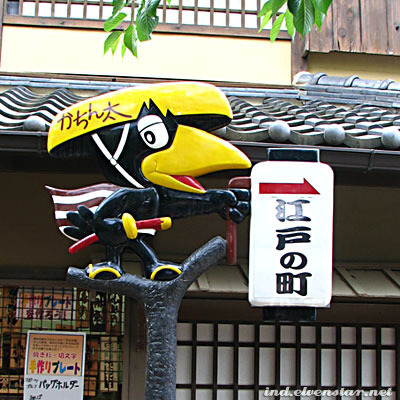 I think this is a crow. Named Kachinta? 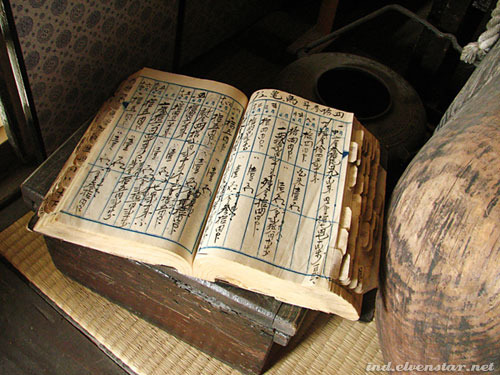 I’m not sure how that last character should be read – it has several different readings. 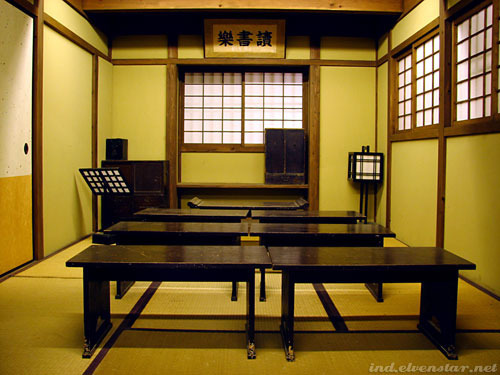 Tera-koya, a private school for children of commoners. Just a shot of part of the park, so you get an idea of it. 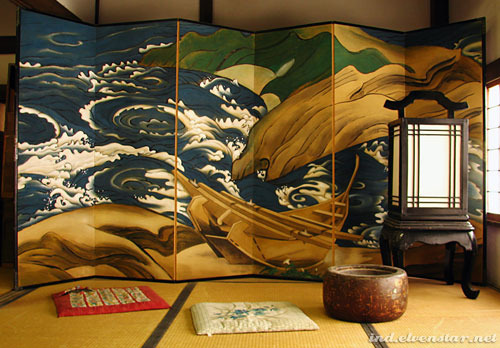 Sandy paths with wooden buildings all round, waiting for you to poke your head in and investigate their innards. I think this place was meant to be a recreation of a restaurant. 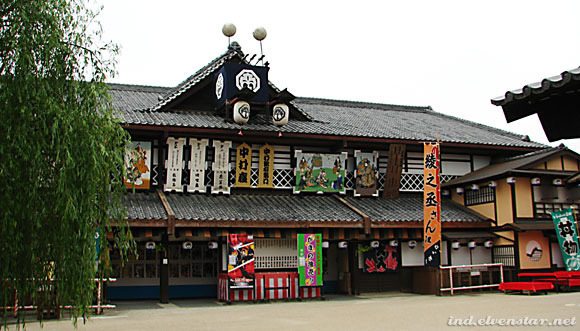 Recreation of the Nakamuraza Theatre, the first kabuki theatre. 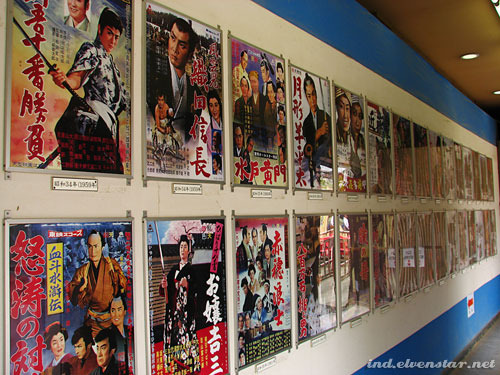 Posters from old Japanese period films decorate the walls of the corridor in the Nakamuraza. 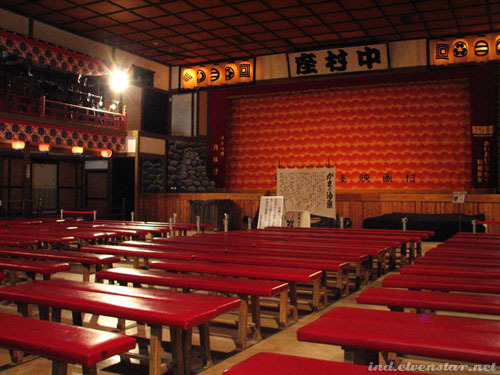 The hall inside. They have performances in here at certain times of the day. 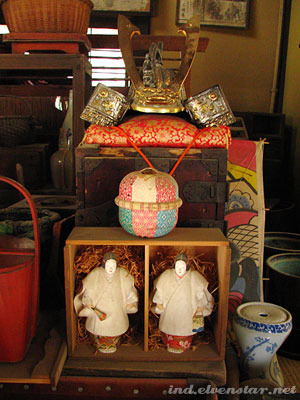 I’m not sure what these are – lanterns? 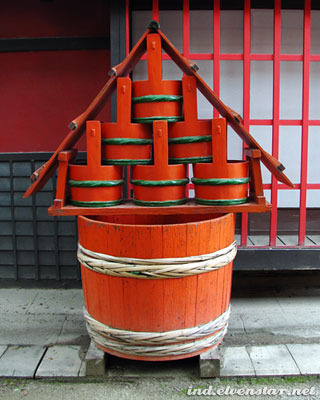 Barrels? Whatever they are, they were interesting to look at. 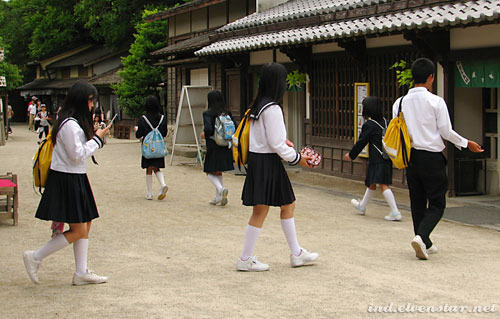 … or school uniforms like these. 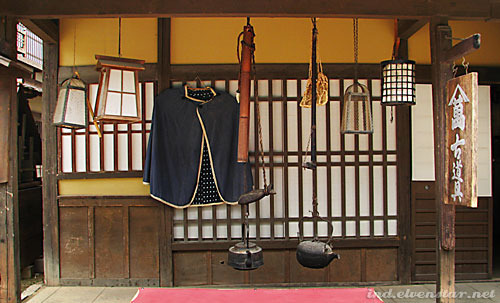 Another platform inside another house, clearly also meant for photo ops. The screen at the back is interesting, I think. Random things hanging outside one building. This place looks nice leh, and with the costumes on sure very fun to take photos with :P Esp it looks empty compare to all those famous temples. 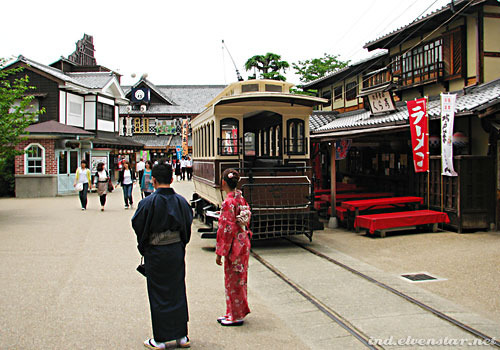 I really should try the kimono / yukata for a day too the next time to Kyoto. 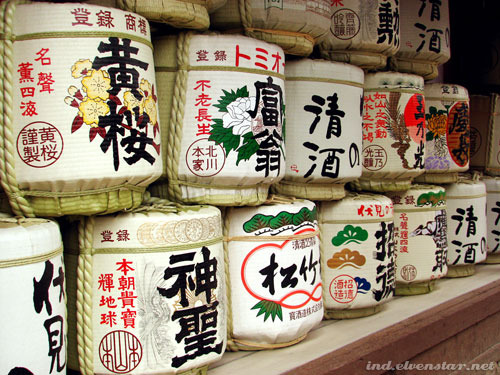 The barrels above in your photo are what sake is made it at the breweries.